Last modified on Saturday, February 17 2007. 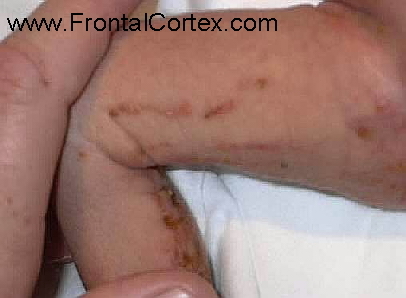 You are called to evaluate a newborn girl with unusual skin findings shown in the images above. The patient's mother suffers from dental abnormalities, mental retardation, and seizures. Which of the following statements about this child's condition are true? A) This findings associated with this disease are less severe in males. This question was created on February 17, 2007 by jdmiles. This question was last modified on February 17, 2007. 2. Victor, M., and Ropper, A.H. (2001). Adams and Victor's Principles of Neurology, 7th Edition. McGraw-Hill, New York. Pp. 1060.